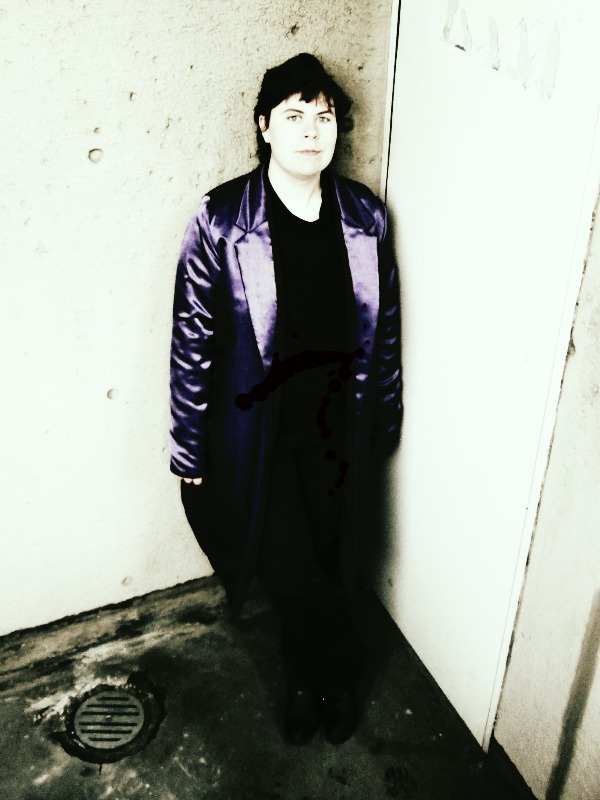 Once upon a time in 2008, I was browsing a charity shop for something good to wear for Hallowe’en, and I saw the jacket. Knee-length, shiny purple. 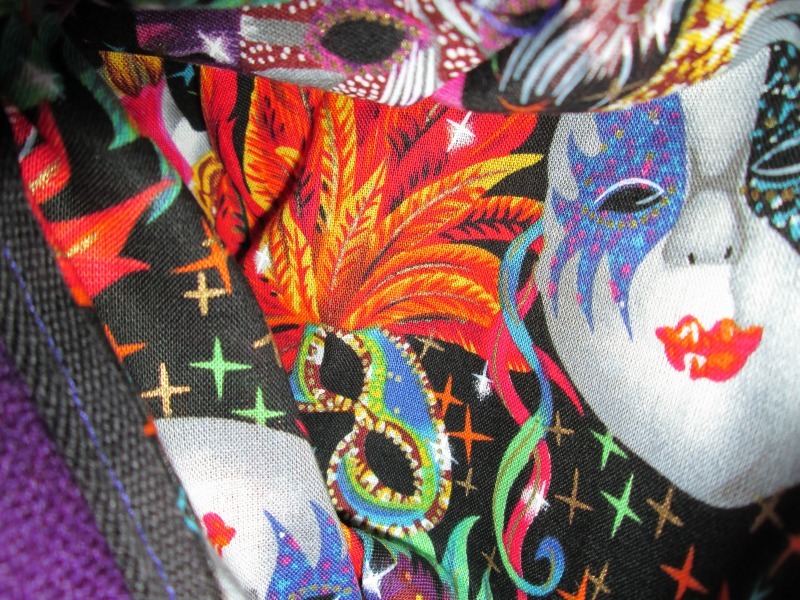 And of course I bought it, and I wore it to the Fab Café Hallowe’en night as part of a Joker costume, and terrified the girl behind me in the queue for the cash machine so much that she dropped her purse. I wore it almost constantly for eight months. Complete strangers stopped me in the park to ask where I got it. And then in June 2009 I went to London for the weekend and left it on a train. And it was never seen again. 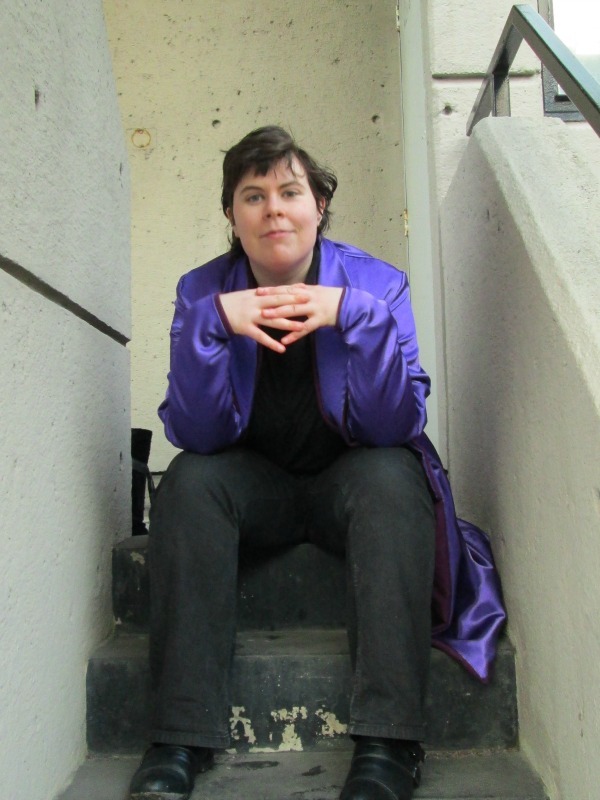 Since I started garment sewing, it has been one of my goals to replicate that most beloved of jackets, but I wasn’t sure I could do my rose-tinted memories justice. Turns out I could. 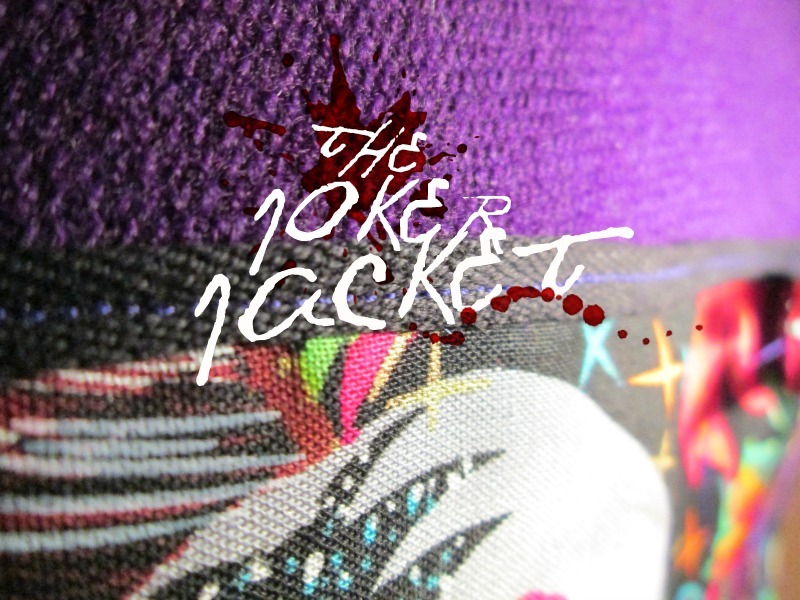 Meet the Joker Jacket Mark II. I had a Burda pattern potentially set aside for the project, but abandoned it without a second glance once the Victoria came along. Victoria as drafted is clean and simple; I set about applying the sewing equivalent of the comic-book vat of radioactive goop, and she came out the other end looking a lot different to how she went in. Yes – reversible. The original jacket was not reversible. This is me deciding not just to go all Replacement Goldfish (warning: TVTropes may eat your soul) on Joker Mark I, but to make it … better. 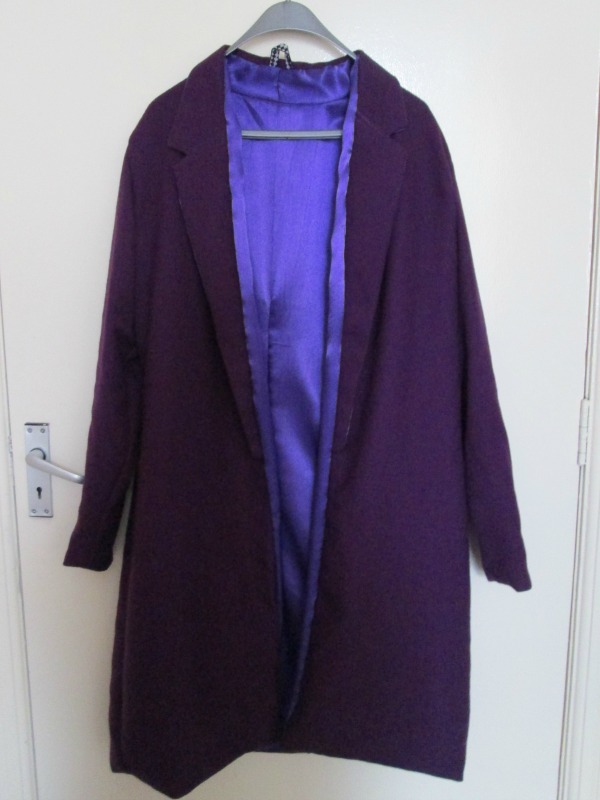 I made up the shell and sleeves in both fabrics, put in the lapels, then bagged them together as per this tutorial. The only difference in the way I did it was to turn the jacket right-side-out through a slit in the hem, rather than the sleeves – as it’s reversible, a cut-and-sealed section in the ‘inner’ sleeve would still be visible when reversed. 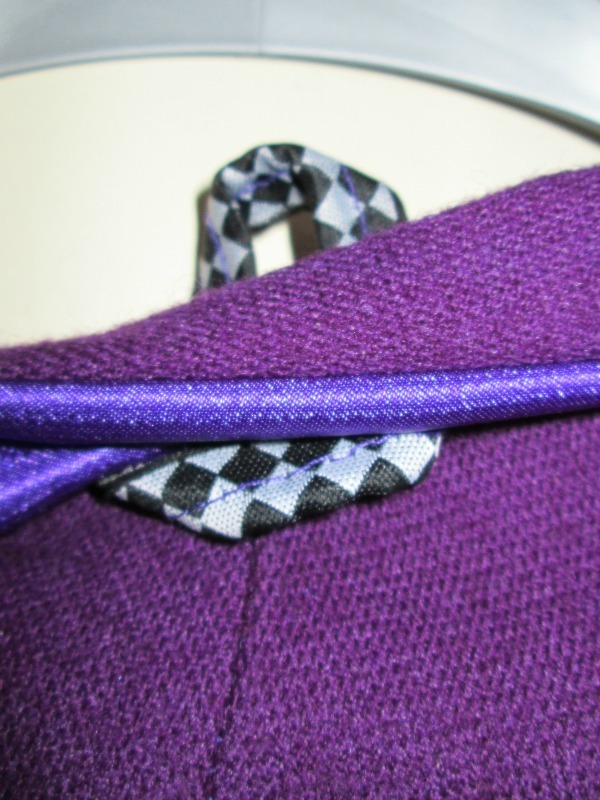 Before I cut the slit in the hem, I put small zig-zags over the seam at the start and end of the planned gap, to stop it ripping wider when I started shoving an entire coat through it. 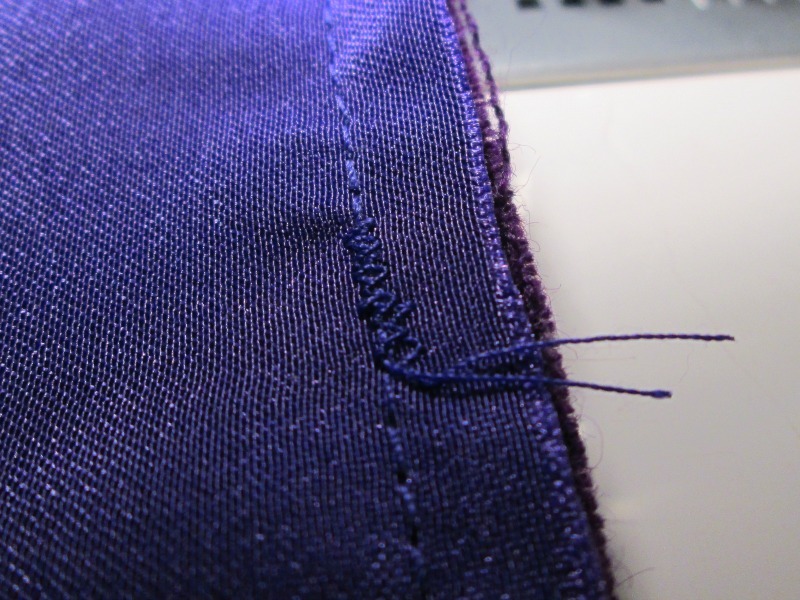 I closed the gap with ladder stitch and am pleased to say that it’s practically invisible. The hem is weighted with pennies, stitched into tiny wool pockets, to get it to hang straight rather than flap. It flaps a bit anyway. Only the wool side has pockets; I didn’t trust the synthetic to take the strain, and it just means that sometimes I have outside pockets and sometimes I have inside pockets. Taking in the waist seam and taking a dart out of CB meant that the pockets sit a bit further back than is ideal, but they work fine. 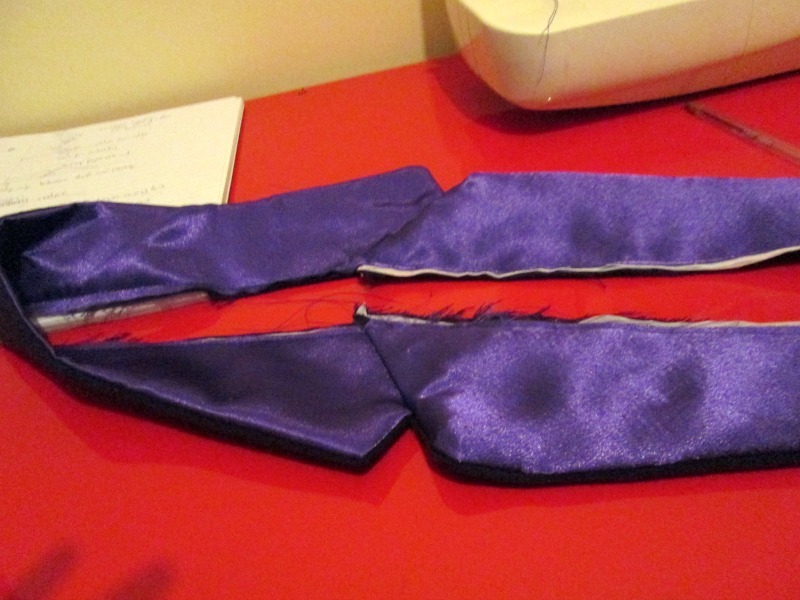 I interfaced the collar and lapels to get the points to come out crisp. That’s not a real notched collar, by the way – I don’t know if it’s even possible to make those reversible. This is a fake notched collar adapted from the Victoria’s existing two-part collar/lapel set-up; I might do a tutorial post on how I made it if anyone’s interested. 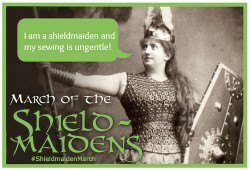 Both sides have hanging loops, caught between the collar and the bodice shell. The loops are stiff ribbon folded in two around a strip of cord. They’re both hidden when I’m wearing it – the inner one between the collar and my neck, and the outer one under the fold of the back collar. Now. Sleeves. Quite apart from the question of the shape of the sleeve as extensively discussed in a previous post, I loathe and abhor setting in sleeves. I’ve experimented with putting them in flat and have had mixed results – sometimes it works, sometimes it just … doesn’t. On this occasion, as I was working with coat-weight fabric (something I have not previously done) I did set them in properly, and made use of a trick I learned in Celia Banks’ workshop at the Knitting and Stitching Show. 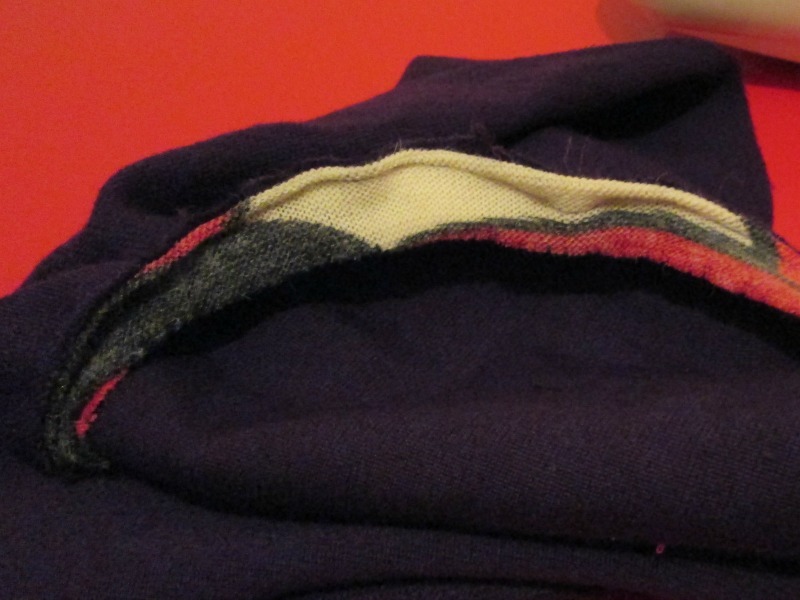 Basically, you get a strip of something thickish but very stretchy – she demonstrated with tie interfacing cut on the bias; I used leftover strips from the Ski Jumper – and baste it to the seam allowance of the sleeve on the wrong side, stretching as you go. Then, when you’re done, the stretchy strip will contract and take the sleeve head with it, making the top of the sleeve slightly concave but not actually gathered. Essentially, it does some of the work of easing in the curve for you, and makes the sleeve easier to set in. Well, it may have worked, or it may have been the glorious magic of the wool fabric, but the first sleeve went in absolutely perfectly, and the second one required only a tiny amount of unpicking and re-stitching to cover the smallest of inadvertent tucks. I didn’t use this, or even stay-stitching, on the shiny layer, as it was already very malleable due to being thin and slidey, and the sleeves set in without real trouble. 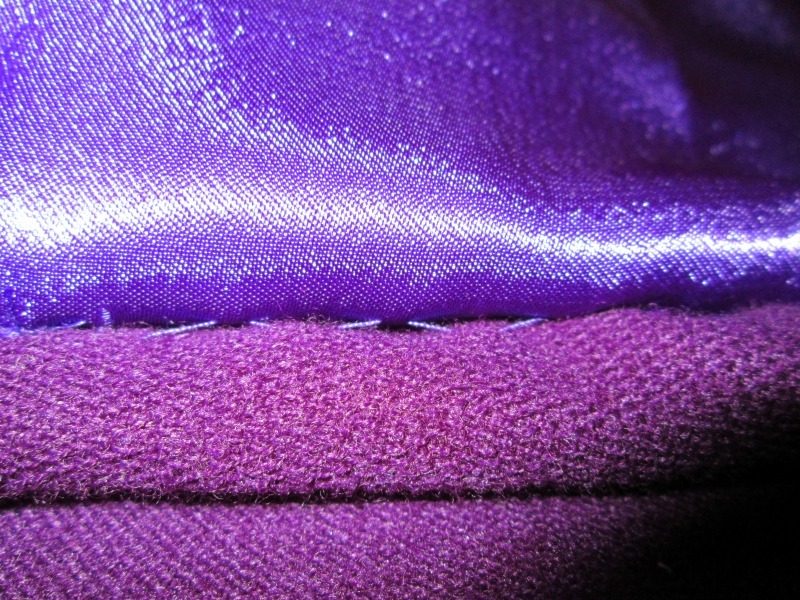 I sewed up the whole of the shiny layer with slightly smaller seam allowances. Basically, it’s fractionally larger than the wool layer in all dimensions. 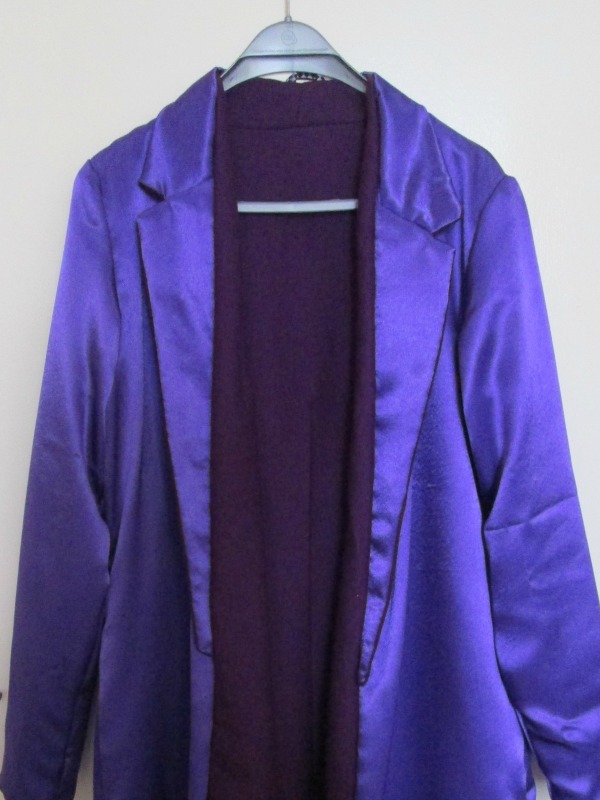 This is because the seam allowances on the wool are bulky, even trimmed and finished, and I wanted to allow enough room for the shiny layer to sit on the outside of the garment without putting it under undue strain. 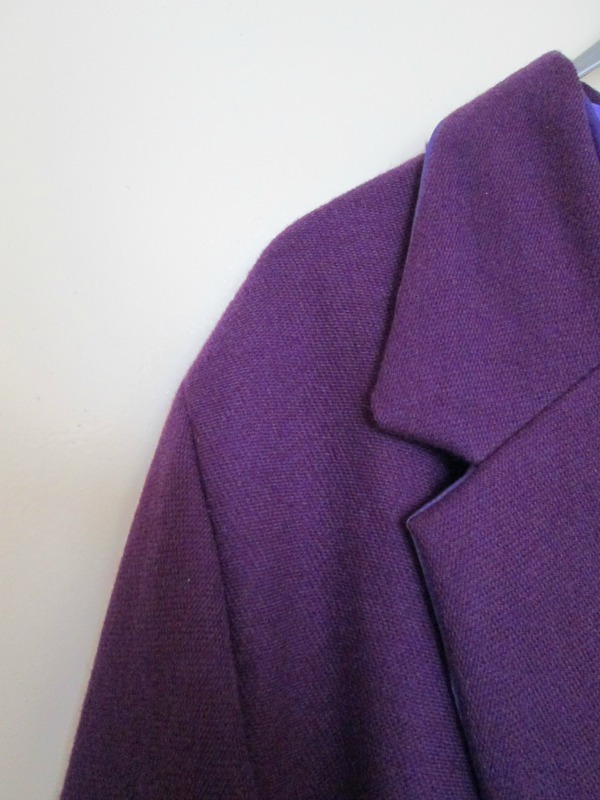 Obverse fabric: ridiculously gorgeous purple worsted, woven by Hainsworths – textile suppliers to everyone from the Household Cavalry to Casualty – and acquired from SCRAP in the shape of three irregularly-sized offcuts. (The selvage informs me it’s Hainsworth Elite Pro, so originally intended as pool-table baize.) It’s 70% Merino/30% nylon, has a steep twill weave and has a flat and a textured side; I used the textured side as the right side. I pre-washed it in the bath and dried it in the kitchen, and my flat smelt all warm and sheepy for days. It cuts and sews beautifully, steams and presses well, and is astonishingly soft and snuggly, with a surprising amount of stretch along the bias; from the non-textured side it looks and feels almost like a sweatshirt knit. SO. WARM. Reverse fabric: shiny synthetic bought from a stall I now can’t remember at the Knitting & Stitching Show in November 2013. This is much closer to the original jacket, both in weight and eye-catching shininess. 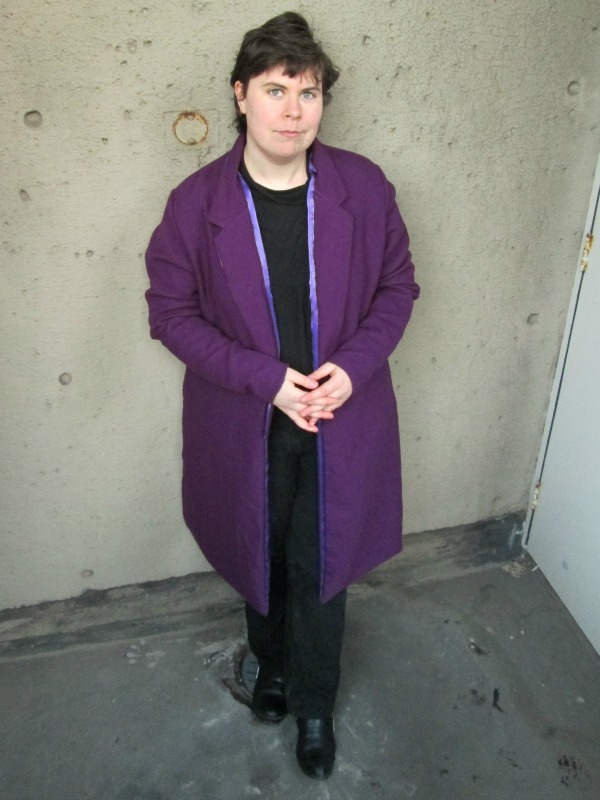 This entry was posted in sewing and tagged By Hand London Victoria, coat, costume, finished, how I make things, jackets, multiple make, pattern hack, pockets, replacing RTW, reversible, sewing, the Joker Jacket, Victoria II: The Dark Knight. Bookmark the permalink. That’s a very impressive project! Must have been tricky getting the edges to behave with two different weights of fabric. Congratulations. The edges still refuse to lie flat – it’s not very visible, but the difference in weight and the bulk of the seam allowances (even graded) means it’s just not happening. I’ve considered topstitching everything to try and get them to sit better but currently it’s not bothering me that much.